ARCOMPANY | Is Your Business Ready for The Changing Face of Multicultural Marketing? Is Your Business Ready for The Changing Face of Multicultural Marketing? Home / Customer at the Core / Is Your Business Ready for The Changing Face of Multicultural Marketing? If you’re in the business of marketing to different cultures – and, in a way, aren’t we all? – when was the last time you took a look at how your marketing is focused? For instance, with the continued rise in use of social networks, are you using this medium or are you still in the “scared of social media” camp? If it’s the latter, where else are you spending your time and energy? Perhaps it’s time to revisit your plan and see how it shapes up next to the latest figures released about multicultural marketing. SEO – search engine optimization – is the #1 platform for targeting multiple cultures when it comes to multicultural marketing, and it’s still a growing choice as well: up 6% from two short years ago. As expected, social media comes in at a strong second, as the “fad platform” becomes further entrenched in more business tactics and strategies. Mobile is also a strong player which, given that the Latin American phone market, for example, is the third largest in the world. However, take a look at the biggest growth areas since 2010 – Twitter, webinars, blogs, wikis and location based apps (think Foursquare and Gowalla). Twitter, perhaps, makes a lot of sense, since its mobile usage makes it more attractive as a target for multicultural marketing campaigns. And you’ll get no argument from me on the strength of blogs as a marketing tool, no matter what market or niche you’re going after. But the others – especially the wiki approach and webinars – shows that there’s a very different marketplace in front of us than there was in 2010. 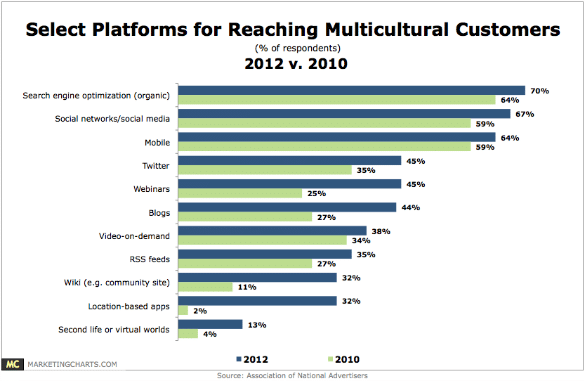 So what does this mean for your business, if your audience is multicultural? If your marketing currently doesn’t include most of the options above, you’re already behind. As social and mobile continues to play a huge part in the overall marketing mix, your business needs to be on the platforms your audience prefers. 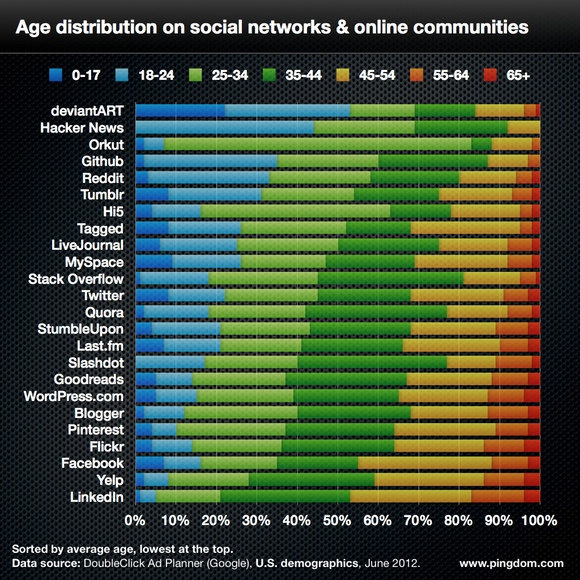 For example, what age group makes up your core demographic and, once aware of this, are you on their preferred platforms as highlighted by the chart below? This is nothing new, of course – even back in the day, you’d choose your markets wisely, from the type of newspaper you advertised in to the radio show you’d buy ad space on. 1. If you’re planning any kind of mobile campaign, make sure your target destination is mobile-optimized or, at the very least, mobile-friendly. Otherwise you’re wasting your money and your customers’ time. 2. Webinars are inexpensive, can share a lot of information at once, and offer the perfect opportunity to gather emails for list building and future campaigns. Use them, and benefit from them. 3. Consider creating a wiki on your own website, with the most common questions; solutions to common issues; shared resources, and more. The more information a customer has on your product, the more they’re likely to try. 4. Be smart with location based marketing. Don’t just reward Mayors for checking in – create loyalty programs and time-sensitive offers. Also, cross-sell with other locations if you have multiple stores in the same city. Buy jeans at location A and get a matching top for 50% off if you also check in at location B. 5. Understand your customer’s preferences. Push marketing via mass media ad buy no longer equates to the most effective promotion path. Find your customer; analyze their pain point conversations with others; provide the solution. As the ANA report shows, customer mindsets have changed drastically in just two short years. Now the question is, has your business mindset? I think in honor of Valentines Day, you, Hessie Jones and Amy McCloskey Tobin should all be super nice to each other today. Lead by example, you know…. I am ALWAYS nice to Hessie. It’s Danny and Sam I like to abuse. Danny, this is a great article, and you’r right in alerting marketers to the fact that Facebook and Twitter are ONLY a few social platforms out there. You talk about a fractured audience. Now, platform is determined by relevance for that culture. RenRen — the new Facebook in China is now a potential force to be reckoned with. And yes, mobile will be critical to try to reach an audience where half of the world’s population resides. @ArCIntel of course! Catching up on my #Arcreading as we speak. @DannyBrown @ArCIntel Nice Danny. So many people think that blasting away the same content on all those channels means the same thing. @DannyBrown @ArCIntel Nope, but I know some people who want too … everybody is the audience. Heh. @richbecker I like the cut of your jib, sir!